The funny thing about hemendex is that the name clearly comes from English. Yet, I have never seen anything like this served in an American restaurant. Perhaps it’s British? 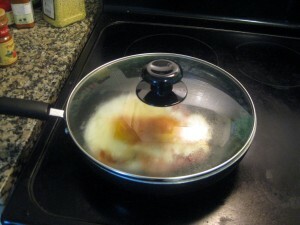 Here is the recipe for this tasty and simple dish that will give you a great alternative to bacon or waffles. 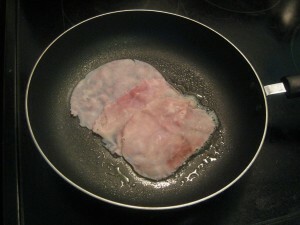 Spray a frying pan with a non-stick spray and brown three slices of ham for about 2 minutes. Flip over, break two eggs, and season with paprika and salt. Cover, and cook until the whites set. The yolks will be little runny. 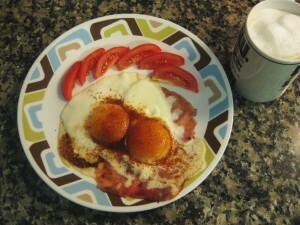 Add a cappuccino and you got yourself a great breakfast! We also have eggs sunny side up here in the States, but these never have ham. It’s good to hear that British have this combination. Seems that the eggs with ham mix never made it over the pond; here eggs are served either with bacon or with sausage links. We have ham and eggs in Canada. 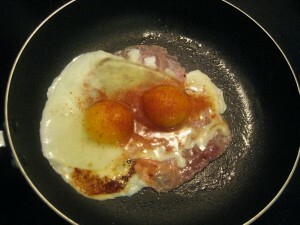 Not like that though… the eggs and ham are always separate from what I’ve seen. This is exactly the info I desired. Thank you for writing this article.